Saturday, June 2, 2018 was the date of our 1000 Cut Challenge fundraiser. A bit of history: we first ran the 1000 Cut Challenge on November 4, 2006 as a fundraiser for Team Canada’s efforts in the 13th World Kendo Championships. This was the fourth time we’ve run one, and I have to say, it was the best ever in terms of numbers of participants and amount of money raised. This year we had 15 participants who raised a total of more than $3400. 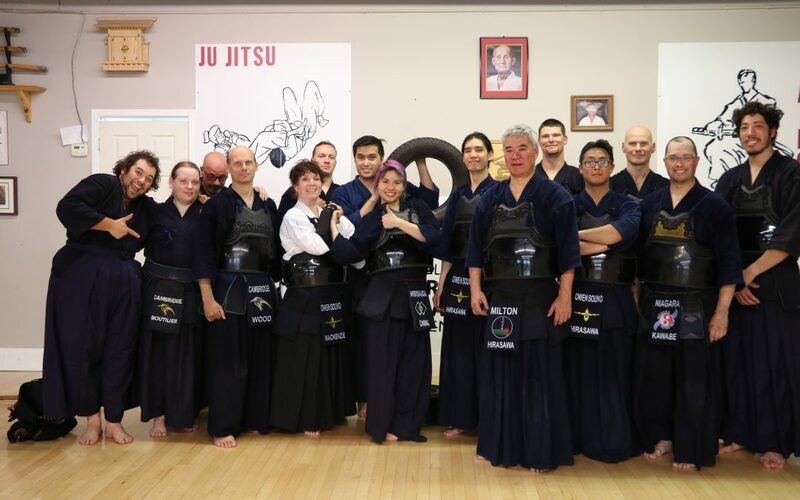 We had participants from the following dojos: Owen Sound, Milton, Burlington, Cambridge, Mississauga and Niagara. The net proceeds from the day will be divided evenly three ways between Team Canada, the Cambridge Kendo Club, and the Niagara Kendo Club. For those of you who’re wondering what the heck a 1000 Cut Challenge is, think of it as a kendo “marathon”. Participants make and receive 1000 strikes. We follow a pattern of strikes (see to the right) and keep a running tally. Combination techniques (i.e. kote-men-do) count for three strikes each, for example. Once we’re done the basic drills, we usually have three or four rounds of keiko (sparring) which adds perhaps 30~40 strikes to the overall tally. As I mentioned previously, this was our most successful fundraiser to date. Small kendo clubs don’t generate much revenue and after rent is paid, there’s very little available. For our club, we plan to use the funds raised to purchase new equipment. We maintain a number of rental bogu (armour) sets so students don’t have to incur the cost of armour until they’re ready to. This helps keep kendo affordable for more people. However, with use, those sets get run down and need to be repaired. We also were able to purchase some new striking dummies (4 in total) which I think will really help improve our training. I am also very grateful for the generosity of our donors. We had a couple of donors who pledged $0.25 per strike. That’s $250 from an individual donor. Thank you so much to all of our donors! Your contributions are greatly appreciated and make a big difference. I am thinking to make the 1000 Cut Challenge a yearly event. We may not run it as a fundraiser every year, but at the very least, it is an incredible training day and an opportunity to get to meet kendoka from other clubs and strengthen relationships between our clubs. It’s a hard event, but it’s something everyone can look back on and say, with pride, “We Survived the 1000 Cut Challenge”. Thank you again to all of our donors and participants for making this year’s event a success!